Are you looking for an enjoyable way to mix with a diverse group of musicians and “keep your chops up” in air conditioned comfort? 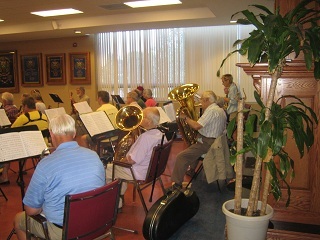 The LaSalle Summer Band will be meeting Tuesdays through the summer in a supportive atmosphere. The music will span a range of difficulties so that hopefully everyone feels a sense of accomplishment and is also stretched a little! 1. Where: Kingston Curling Club – Days Rd just north of Front Road. 3. Time: 9:30 am -11:30 am with a mid-practice break. 4. Conductor: David Smith – David has very extensive performing and teaching credentials. We are delighted to have him for this summer. 5. Cost: $40 cheque only – make it out to LaSalle Adult Band and give to Judy Wolfe-Labbé – in advance if possible. At this price, even if your busy summer travels have you missing a number of sessions, you would still get your money’s worth! 6. Music: everyone will get a named folder with their music on their first day. 7. Bring your music stand, a chair/stool (unless a chair with arms is OK), and a spit towel (sorry make that a “condensation” towel!) to go at your feet, to keep the floors dry. 8. Sign up on the sheet in the LaSalle music room or contact Karen Wallen (kawallen) no later than May 24th. See you June 26, 2012 at the curling club. The senior band is booked to play a school concert at JE Horton Public school in Barriefield Village on Wednesday May 9th at 10am. Thanks to Julia for the legwork. A reminder that there will be no adult classes on Wednesday April 25th due to a matinee run of Anne of Green Gables at for elementary students. The music room will be used as a staging area. LaSalle Causeway Swing Band Notice of Gig in Sydenham, Wednesday, April 18, for 5:00-6:00 pm. honouring South Frontenac Community Service volunteers this Wednesday from 5:00-6:00 pm at the Grace Centre in Sydenham. The Sydenham organizers extend a warm welcome for friends of the band to attend the event. next to the parking lot. For those who know the area, the Grace Centre is in the former United Church on Stagecoach Road. The organizers are in the process of renovating the former sanctuary so the event will be taking place in the renovated basement. In order to get to the Grace Centre from the 401, the best route is to take the Sydenham exit (#613) – go north until you hit Rutledge Road. Make a left at Rutledge and then another left at Stagecoach Road. The Grace Centre is on the right hand side, opposite Clinton Dentistry. Thank you on behalf of the Causeway.